Replacing your gutters is one of the best things you can do to protect your home from water damage, which can destroy your home’s foundation and lead to costly repairs. The team at DeKalb Roofing Company has extensive gutter installation and gutter replacement experience and can provide you with top quality gutters that will serve your home well. Many homeowners do not give their gutters much thought – that is, until they experience water damage. When it comes to your gutter system, it’s best to be proactive and make sure your gutters are ready for any weather. Your home’s gutters are vital to the integrity of your home’s structure. Without a good gutter system, your home is susceptible to extensive damage from rain, snow, and other weather conditions. Choosing the right gutter system – and the right company to install your gutters – are very important decisions homeowners must make. Making sure your gutters are in good shape is especially important before winter, when snow and ice can build up. Your gutters should be clear of debris to allow them to do their job, and the system should be installed properly to ensure that your gutters will work properly and be able to support the weight of increased precipitation. Except for in the corners, your gutters should not have seams. Using a gutter machine, we assemble your gutters on-site for a seamless installation. Rather than using pre-cut gutters, we hand cut your new gutters to ensure a perfect fit. Our gutters function well and look great. In addition to installing your gutters, we can also provide you with quality gutter covers. These are useful because they prevent leaves and other debris from building up in the system and blocking water flow. Homeowners who have gutter covers do not have to clean their gutters as often – which is good, because it can be a dangerous job. 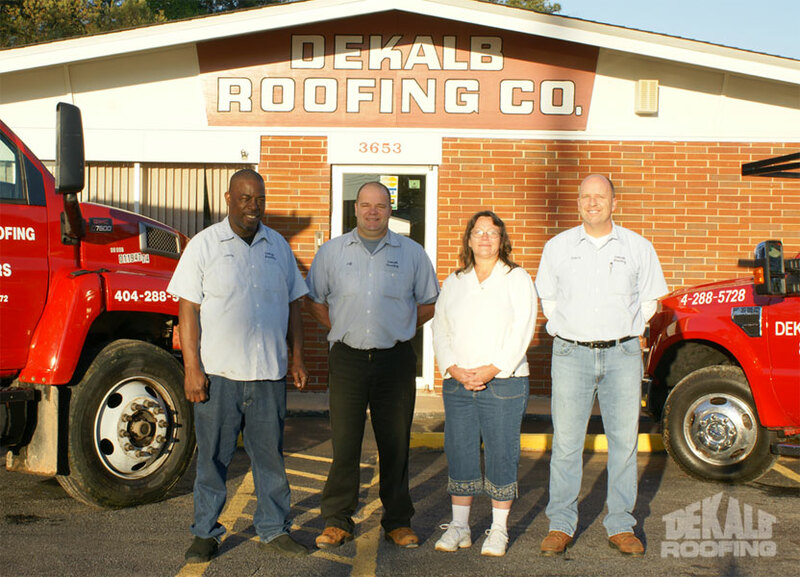 A Job Well Done: At DeKalb Roofing Company, we have more than 40 years of experience in providing Atlanta homeowners with high-quality, well-crafted roofs, gutters, and gutter covers. We stand behind our work as well as the products we use. Fast work: We pride ourselves in completing jobs in a timely manner. We value your time and understand that you want your home “put back together” as soon as possible, which is why we work to finish quickly. Most jobs are completed within 1-2 days. Fair pricing: The gutter installation and replacement estimates we provide are fair and competitive. You can feel good about your decision to hire us to install your gutters or gutter covers. 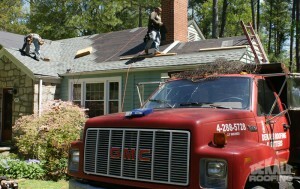 Now, before winter weather hits in Atlanta, is the best time to make sure your gutters are ready to protect your home. If your gutters need to be replaced, or if you are interested in having gutter covers installed for lower-maintenance protection, contact us today. We serve homeowners in Decatur, Stone Mountain, and the surrounding areas, and we are happy to provide you with a free estimate. This entry was posted in Gutters and tagged gutter installation services, needing new gutters, when to get new gutters on November 26, 2012 by DekalbRoofing. At DeKalb Roofing Company, we offer roof and gutter installation estimates, free of charge for all services. Also, you and your family can feel safe and secure with the services we provide because we are fully licensed and insured. The high-quality products that we use are backed by warranties, and we provide you with the written warranty so you can feel safe and secure for many years to come. 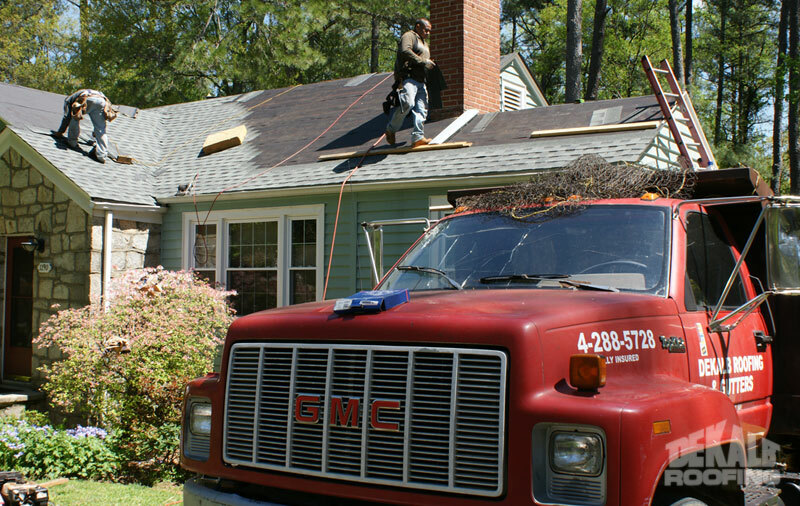 Since we’ve been in the roofing industry for the past 39 years in the Atlanta area, countless customers feel satisfied and happy with the results we provide. 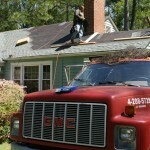 Our top roofers have been employed with us in the roofing industry for 10+ years. That means that each and every installer is equipped with the knowledge, skills, and expertise to deliver quality, top-notch services to you and your family. When it comes to selecting a roofing and gutter contractor for a free estimate, their training and experience is critical. With many years of experience, we know how to give you excellent results with quality craftsmanship. Our philosophy is that we do it right the first time. So after we give you the free estimate, you can look forward to getting the best roofing and gutter installation services in the area. To top it off, you can enjoy your new roof or gutter within only a short amount of time–we finish most projects within 1-2 days! How important are gutter systems? Gutters are very important to your home, specifically important to your roof and siding systems. Without properly installed gutters, you could face disastrous events when the next storm hits (i.e. flooding, blocked gutters, broken gutters, etc). Some problems that can be caused that you cannot see include mold and mildew, which you know can do substantial harm to your family’s overall health. So it is very important to choose the best contractor. Not to mention the importance of the gutter guards that we also offer here at our roofing company. The gutter guards are critical to keeping debris, sticks, stones, and dirt out of the bottom of the gutter. If your gutters become clogged, serious damage can occur (flooding, damage to your roof, damage to the sides of your home’s exterior, etc). That way, when you have gutter guards installed, the water can run through the gutter freely and drain properly in the downspouts. When you have a properly installed gutter system, plus gutter guards, your home will be even more protected and safe! We fix leaky roofs, too! Also to keep in mind is that our roofing company can fix your roof leaks. It is very important to fix your roof as soon as you suspect a leak so that further damage to your roof and home does not occur. Furthermore, if your gutters are cracked or broken in certain areas, we can fix your gutter and/or install a new gutter system if need be. So if you are looking for gutter installation estimates in Atlanta, we greatly encourage you to call us today. We want you and your family to feel safe and secure with your new roof or gutter system! So call us today! When it comes to protecting one of your most valuable assets—your home—you most likely want the best products on the market. That decision definitely holds true when it comes to choosing the best gutter guard product available. Well don’t worry about making that decision because our Atlanta roofing company uses only the best products, which are typically backed by warranties, too. Knowing that you need to replace your existing gutter guards, or if you simply choose to add extra protection to your gutter system, we offer you an exceptional gutter guard product—the LeafSolution. For the past 39 years in business, our customers have been very pleased with its performance. Did you know that certain gutter covers could fit inside your existing gutter so you won’t have to replace your entire gutter system, unless, of course, there is damage to your gutters and you need them replaced? Well, with the LeafSolution gutter cover, we could install it to fit within the gutter you already have. Just in case you need a new gutter system to go along with your gutter guards, DeKalb Roofing Company also offers gutter installation services! In other words, we have all of your roofing and gutter needs covered! Why do I need a gutter guard? 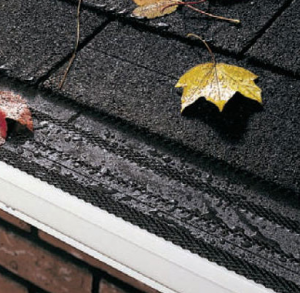 The intended purpose of gutter covers is to prevent clogging. When gutters become full and water becomes stagnant, it can attract mosquitoes, bugs, mold, and even weeds or grass if they haven’t been cleaned in a long time. With gutter covers, you won’t have to worry about that! Gutter covers keep out debris, leaves, sticks, and twigs so the water can run through your gutter freely, and won’t get clogged. Gutter covers allow your gutters to function to their highest potential because they will clog less frequently when you have covers on them. If gutters clog and you don’t fix them, you can cause severe damage to your roof, basement, or patios. When gutters are clogged, the rainwater can’t run the normal course through the gutter. This results in the rainwater seeping out over the gutters, onto your sidewalk, concrete, bricks, and the side of your house. Sometimes, this causes damage, creates mud on the ground, and can sometimes lead to the formation of mold. Well, with gutter covers, the rainwater will exit the gutters the proper way—through the downspout. Are you ready for your new gutter guard? Are you ready to schedule your appointment with our roofing contractor to get the LeafSolution installed? If so, we encourage you to call us! Gutter guards are absolutely a great investment so that you can protect your family and your home at the same time. Do you want to learn more about gutters so that you can keep your home and family safe and protected? Our roofing company will help you understand more about gutter installation, such as how to detect signs that your home needs new gutters. Does your home need new gutters? Clogs or backups—Almost every homeowner knows that gutters clog every now and then, but if you notice that your gutter is clogging a lot, but it’s not due to massive amounts of debris, sticks, or leaves in it, then the clogging can be due to improper alignment of the gutter system. This can be because of improper gutter installation, and can result in severe damage to your roof and home if not quickly and properly fixed. Chipped paint—If you notice that the paint on the outside of your gutters is chipping or breaking, this is a sure sign that your gutters will definitely deteriorate in a short amount of time. You should pay special attention to its wear and tear, but if you’d like to play it safe, you may want to schedule your gutter installation appointment soon! Rust—You will notice rust in or near any crevices or seams on your gutter. To detect rust, you will have to use a ladder to inspect the gutters up close. If you see rust on the outside, there’s a good chance your gutters are rusting from the inside, too. This means that, within a short period of time, your gutters will break and leak. Breaks or fractures—While you are inspecting your gutters for rust, you should also look out for areas where your gutter is breaking. This can cause leaking and further damage if not repaired quickly and properly. Water damage—If you see damage to the sides of your house underneath your gutters and downspouts, or on your sidewalks underneath the gutters, then this could mean you have extensive water damage. This can be happening in places where you can’t even see, which means the problem might be a lot more serious than expected. If so, gutters should be replaced very quickly so additional water damage does not transpire. Come see us for gutter installation services! If you evaluate these signs, and you decide you need gutter installation services, you can contact us today! When you hire our contractors, you will see that our customer service and craftsmanship are second to none—and that’s been evident throughout the past 39 years that we’ve been in business. Feel free to contact us for your free quote! This entry was posted in Gutters and tagged gutter installation services on July 22, 2011 by DekalbRoofing.